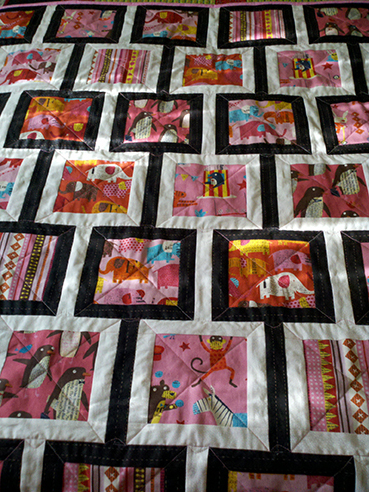 Today was the first meeting of the Louisville Modern Quilt Guild – woo hoo! I had no idea how many people to expect, but was very happy to meet 10 women of all ages interesting in modern quilting. I brought my quilt for baby Audrey, and one of the women brought several tops she’d made, one had the Tula Pink Saltwater fabric I’m considering using for my next project. It looked gorgeous and really inspired me to get cutting and sewing. We’ve already set our next meeting, Saturday, June 1, at Among Friends Quilt Shop, from 2-5 p.m. If you’re in the area and would like to join us, we’d love to have you. It will be a sew-in, so bring your machine and whatever supplies you’ll need for the afternoon’s project. To get to know each other better, everyone should bring a modern block, work in progress or finished quilt that’s indicative of their style — we’ll briefly explain to the group what inspired us — and a project to work on. I can’t tell you how excited I am that there was a good turnout for the first meeting, and can’t wait till our next meeting to see what everyone brings. I’ve been busy for the past couple of weeks buried in a few extra curricular projects, one of which was finally finishing the quilt for baby Audrey, who’s due to arrive in early May. I have to say, this was probably the toughest quilt I’ve done to date when it comes to the actual quilting of the layers. I’ve never ripped out so much stitching in my life, with the possible exception of parts of sweaters I’ve had to redo. To be honest, I’m not even completely sure why this one was so tough. For some reason, I couldn’t seem to get the back taught enough for the straight line quilting I wanted to do, even though I basted it three times. I tried free-motion quilting and had to rip that out as well. The criss-cross lines I settled on have uneven stitches, which I attribute somewhat to me and somewhat to my machine. It’s never really been the same since it was worked on last year. 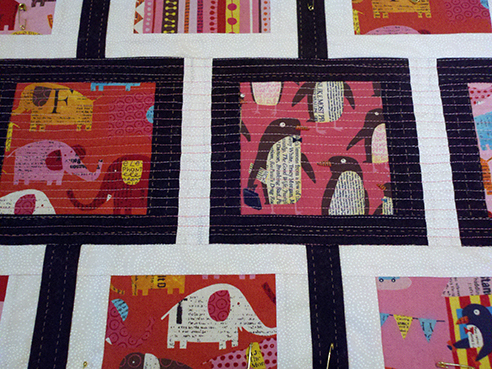 The quilting may not be perfect, but at least it’s done. 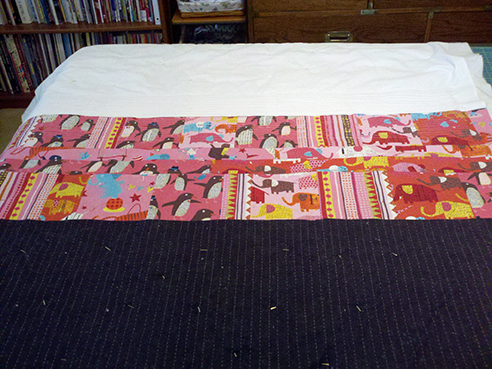 I’ll admit once I got the binding on and was able to step away from it, I found I wasn’t that unhappy with the result. Or so says the recovering perfectionist in me. If only all my lawn was that green! I didn’t notice my reflection when I took this shot. 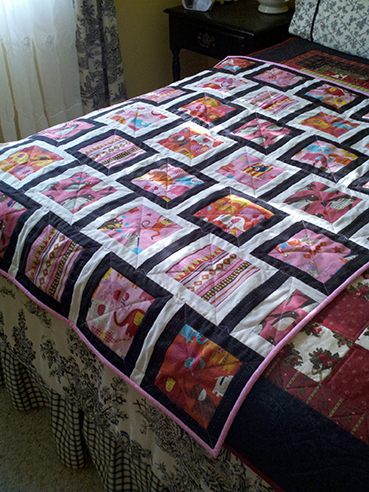 Here it is on the bed in my guest room on what I call my quilt pile (It’s where I keep them all flat.). I really like the soft light coming in from the window, as well as how the pink looks against my black/tan French toile. 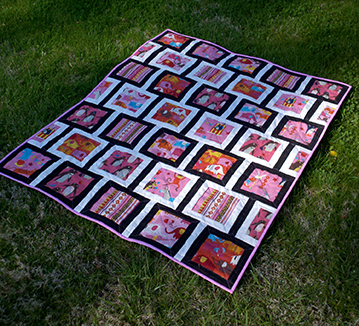 Even though it had it’s tough moments, I did learn a lot making this quilt. 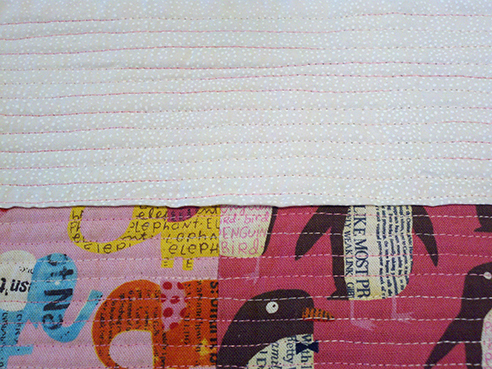 One thing was I’m not sure I’d use the Kokka Japan fabric in a baby quilt again. I love the look, but it feels a little heavy to me. I think I’d rather use it to make a diaper bag, or maybe fussy cut it in small pieces to use as an accent. I’m also considering investing in a new machine and would love to have the Juki 2010Q. Every blog post I read says how wonderful it is, with very few drawbacks. I saw a deal on one online that comes with a frame for under $2,000, which wasn’t a bad deal. Now my decision is do I bite the bullet and buy it, buy just the machine, or send my quilts to the longarmer (my machine still seems to piece pretty well), which given how much fabric I have in my stash would cost far more than the machine and frame. Either way, it’s a lot of money. Anyone have any ideas? Have you faced similar situations? In the meantime, I’ll keep piecing. 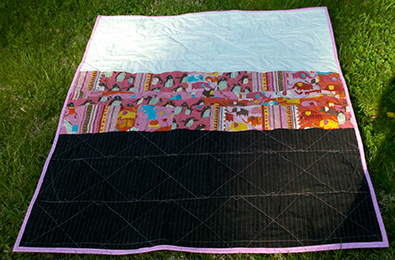 I’m already plotting my next quilt, which is a bed-sized one for me, out of Tula Pink’s luscious Saltwater fabric line. I just love her stuff and can’t wait to get started. Thanks so much for stopping by. I hope you enjoyed your visit. Do you ever have days at work where you come in with all sorts of plans for what you want to get done, only to have them thwarted by the unexpected? I guess everybody does, and that has definitely been my day today. All week, I had looked forward to hours of uninterrupted time so I could finally start — and finish — the circus quilt I’m making for my friend’s baby, a girl he and his wife plan to name Audrey. The due date is May 15, but her father is convinced she’s going to show her face around the end of this month. The stitches are a bit wonky, but that’s not what bothers me here. That flap where a clean seam line should be? Not so good. The gap here isn’t so great either. Ripping all this out didn’t exactly thrill me. 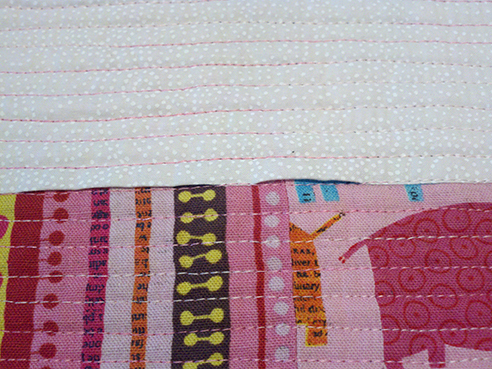 I told myself I could live with the uneven spacing between the lines of stitching. I even gave myself a reassuring pep talk, saying my friend wouldn’t be that picky. My idea here with the placement was to mimic a top and skirt, with a really cool belt cinching the waist. As annoying as they are at the time, mistakes are usually a way of getting me to slow down and not be in a rush. If I’m lucky, I’ll come up with something better than my original idea, though at the very least I hope I learn something from them. Mama was right. A couple of months from now, as I proudly and lovingly give the parents-to-be this quilt, the last thing I’ll think about is the two afternoons I spent fixing my mistake. I’ll be far too busy cuddling their adorable new baby.